Many of us are facing this situation at some point in our lives, which is that we need to make the space we are living in to look larger than it really is and this happens mostly when we cannot afford large homes or apartments and we are forced to live in small rooms. 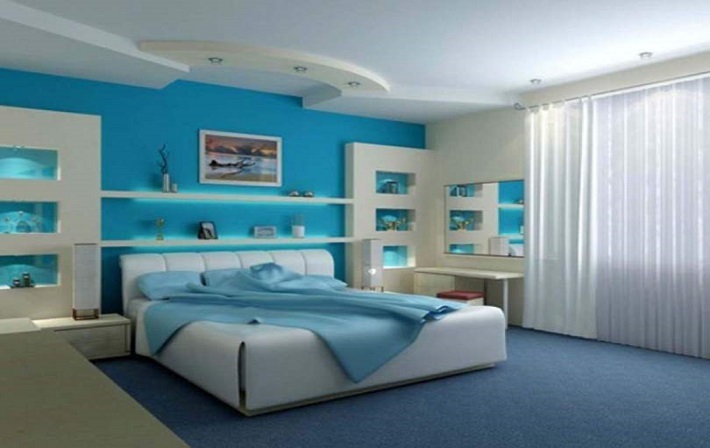 There are a lot of things that you can do to make your rooms look larger than they are and one of them is simpler than many of us think: you can begin by painting the rooms in certain colors and then choose decorations according to this, for obtaining a color theme that will make your rooms to seem larger. One of the rules of making a room appear larger is to have the same color for window blinds and the walls. This will definitely create the illusion of a larger space. Probably the ideal way to make your rooms look larger is to use white as much as you can, because white can give us the impression of having more space and it works really well with any other color. You can use the natural light from the sun to “create” even more space and white reflects it the most. Another color that is perfect for small rooms is yellow, with the condition to be a lighter shade of yellow. When you want to create the illusion of space, you can think of something really big, like the ocean. Yes, you can use light shades of blue for the walls, but also some light shades of green, as this can be helpful for creating a more “open” ambiance in a small room. You can play a lot with colors and contrasts to create a suitable theme. But, when we have a small space, we are forced to find creative solutions and this involve more than just color. Besides choosing the right color themes, there many other methods and tricks to make your rooms look a lot larger than they are and the best examples can be rearranging or changing furniture, using transparent furniture, using mirrors, using multifunctional furniture pieces and so on. Another great way to create a more “open” look is to use window blinds instead of drapes as a window treatment. If you are a creative person, there are no limits regarding what you can do to trick your rooms into becoming larger even if they are the smallest.